What this new website means for this family is that I need to get rid of the old and not-so-great toys and organize and promote the toys that are great. Even with the greatest toys, kids get tired of it and sometimes I just need to show more interest or introduce a new challenge. This is not easy and you need good mental health to maintain this goal. Right after this site went up, I came down with laryngitis, but who takes a sick day right after opening up a toy review web blog at the beginning of the holiday shopping season? Not me. Thus, I exhausted myself and dropped many balls. So this house became a huge mess. I was barely a mother and a wife and so with toys coming in and none going out, not organizing the rest of the house, and trying to make sure that at least my kids had something to do even though I was just miserable, things went downhill. I really looked at my family and felt like everyone was so ungrateful. Losing sight of what is good in your life is the first step into misery. Obviously, I need to take a time out - a mom's time out. I wish I could take really long time-outs. But it is the holiday season and we can not postpone holiday-related "things-to-do" whether we are sick or busy at work or just plain overwhelmed. They are here and then they are gone and hopefully you will have enjoyed them. One of my children's doctors told me that the holidays brings about strange behavior in kids especially because of all the toys. I looked at him with Bambi eyes. Really? I had to rethink my perspective and fast and so I came up with two good tactics. If I have more, I will share later. I promise to model patience and resist impulsive acts but still remain open to possibilities so that I won't regret being conservative. I realize that shopping right now and getting great deals are important and sometimes I have not made up my mind about what I want to buy because I like to research stuff to death. However, if something I have been thinking about is on BIG TIME SALE then I have to make a decision. It's just so grown-up. I hate it. 1. Do I want to pay more later (possibly) if I end up deciding it is good for the kids? 2. Do I want to buy it now and return it as a worst case possibility? For Question #1: I think you can pay more later if you are NOT going to save THAT much money. Sometimes we see things like 30% OFF and think, "WOW, that is a good deal" but maybe that means $3. And sometimes saving $3 on what ends up being a bad toy purchase can cause you minor self-loathing. For my children, it can bring about behavior resembling that of children who believe that toys grow on trees. For Question #2: If returning the product is not difficult and it's a really good deal then I am going to get it! I explained this to Number 1 and he understood (hopefully). I explained that I can save up to $40 for a certain toy that I bought recently. However, after doing more research and I still convinced it was for us (irregardless of reviewing decisions), then I could just return it. It's really just buying time. I explained there is still could be a loss (gas and time) but the potential gain outweighed potential loss. Some kids can understand this, I really think we can give them this chance. Actually, I have decided that I am going to challenge Number 1 to come up with reasons why I should open certain toys (and therefore keep them). If I felt that he was ready, I would let him search the web on his own but for now, I will let him watch YouTube videos in a list that I will create, review, and then give to him to watch. Then I can invite him to present his case and convince me to buy the toy. Click here for a sample list. By the way, I should mention that just because I don't review this particular toy pictured above does not mean I don't like it or that Number 1 couldn't convince me. Because of the associations to the mind that this toy has and the nature of this review blog, any such toys would likely require a lot of time for reviewing. Either way, I think this method of advanced-saving will not tax me if I can use it to encourage my kids to use their budding research and advocacy skills to tell me why a toy can be good for them (fun, educational, exercise, etc..) When it is in your house, right there in plain sight, the motivation is there. I just have to stick to my promise and also use this great opportunity to teach Number 1 and 2 how to speak up for themselves and convince me of an idea (hard part #1). If they can not and I can not find a good reason to keep the toy then I need to explain it to them well. (hard part #2). They will hopefully learn to be more grateful when they see some of the things that are necessary in the decision-making aspects of buying a toy. I hope they learn to become better consumers too. I like to think that this could be a family trait. My brother is an eBay expert! We have the nicest downstairs neighbors. My boys have the heaviest feet in the nation but they rarely ever complain. However, after a few months of our gerbils rolling around the kitchen in their exercise balls on top of their heavy feet and sometimes bursts of wakefulness and energy in the early AM hours, it was time to talk to us. They did so with a note and bubble gum. Seriously, I'm not making this up. They are that nice. 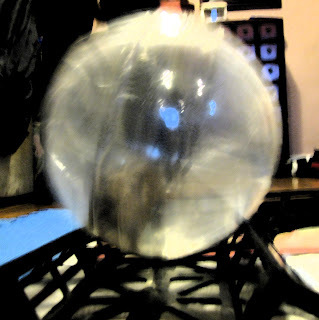 I hadn't realized that the gerbil ball rolling would bother them but after they asked about it, I realized that I had to do something and so I found the Hamtrac. For just $13, I was able to buy a great way to minimize noise, minimize clean up, and still provide good exercise for my son's gerbils. BTW, gerbils need good exercise especially one of our gerbils who won't run on the wheel because it's not his style. But when we got our Hamtrac, I ran into a problem. One of the connectors to the track wasn't fitting in so smoothly. I should have just taken a step back and figured out another way but I was impatient. Number 1 was anxious to try it and so was I and so I started jamming it and ended up breaking a connector piece on the other side of the track. While I should expect things to go more smoothly, I should know better. Nothing is perfect and I should have used my brain. It's not like this track costs $113 dollars, no it only cost $13 dollars and I have liked everything that I had purchased from Superpet. But I couldn't slow down and so I broke it and wrote a huffy email to the company and you know what, they sent me a new one free-of-charge. Wow. Prior to getting the new one, however, Number 1took the Hamtrac and changed it into a square shape and the missing connector piece was less obvious. Thus I gave away my Hamtrac to a friend in our building and we have decided that on occasion, we'll but her tracks and our tracks together to make one big tracks. Now that would be fun. Upon writing this post, I discovered yet another ball track that looked just as fun (and cheaper $9.99!) Seeing it helped me figure out that I could make a circular track with the pieces I already had if I wanted only one ball running on a track. Why couldn't I think of this myself? Oh, I better slow down some more! I'm missing everything! And that is EXACTLY what I want to avoid during the holiday season. The whole point is not miss out on the important stuff like being grateful for what you already have and for the people who are in your life. Click below for some more articles I found about some things that can after receiving lots of toys for the holidays. Salutations. I think I have been a good girl this year. I actually started a new website to help other parents like me use toys as tools to help their children to develop into the persons they want to be. This year, I am a little worried that my kids need to grasp the meaning of how much work goes into making, shipping, and buying a toy. So, can you send us the Lego Toys R Us truck? It's kind of silly but I kind of want to show Number 1 and Number 2 that toys do not fall from the sky (unless you dropped one by accident). I would like to give them a visual 3D representation of real-life activity that shows that toys come in a truck to a toy store and real people (the minifigures) must unload them, register them into their computer system, stock it on the shelves and then with my existing lego blocks and minifigures (see below), I will show my kids that people buy these toys and then take it home. I promised to encourage the building of a toy factory so that they understand that it must be made by humans and machines before it becomes a toy to be loaded onto the truck. If the Toys 'R Us truck is out of stock in your shop, you can give me the yellow Lego truck instead. P.S. 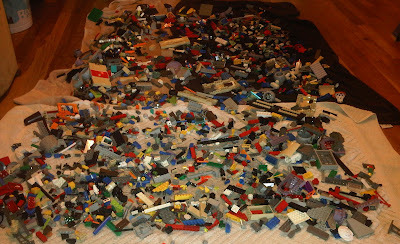 I was extra good when I saved money and bought used legos, wasn't I? See how much I got for just $25? Aren't you proud of me? I washed all of them and it took forever. They were kind of dirty. Disclosure statement: Toys are Tools has not been compensated in any fashion by the manufacturer or retailer of any mentioned products or websites for the publication of this post . *this picture was altered into a "painting" effect just because I thought it looked prettier.